The Steans Family Foundation is pleased to announce the Steans Emergency Scholarship Fund (SESF) to support North Lawndale scholars who are enrolled in college and demonstrate financial need. The Steans Family Foundation advocates education as the strongest foundation for personal and community development. This is why the Foundation supports a host of educational activities aimed at undermining the social structures that contribute to unemployment, poverty, and hopelessness. Our investments in North Lawndale are targeted toward an educational continuum from birth through college and we believe that a strong educational foundation is the key to a positive future for the young people of North Lawndale. The goal of the SESF is to support the college retention and ultimately, degree attainment of North Lawndale college students. The SESF will not be publicized widely as scholars are expected to utilize institutional and family resources before receiving assistance from the fund. Schools are eligible for up to $5,000 per class of graduating students not to exceed $20,000. Scholars apply to the fund through the high school and can receive support up to $1,000 per year, though average scholarships are expected to range from $250.00 to $500.00. In return for this support, scholars must agree to "pay it forward" through community service or volunteering at the host school to speak to students about their postsecondary experience, host high school students at their college campus, assist with research on school effectiveness, participate in school outreach to funders, etc. 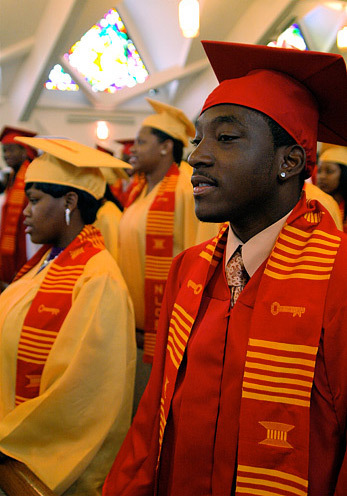 The sponsoring high school must operate within North Lawndale. 2. The sponsoring high school must demonstrate capacity to oversee the SESF through the identification of a point person who will be responsible for all aspects of the program. Scholars must be a graduate of the applicant school. Scholars must be enrolled in a college or university. Scholars must present the most recent copy of the Financial Application for Federal Student Aid, the school award letter, and the most recent unofficial transcript (minimum print out from school website) to the high school contact person. Scholars must demonstrate the utilization of institutional and family resources before receiving emergency fund dollars. Priority should be given to scholars who are residents of the North Lawndale community. The sponsoring school must complete the Steans Emergency Scholarship Fund Application by April 26, 2013. Schools will be notified by June 11, 2013 if the application has been approved. You can check the status of your application on your My Account page. If approved, a check will be disbursed to the school by June 30, 2013. The sponsoring school is responsible for staffing the Steans Emergency Fund. The sponsoring school is responsible for maintaining adequate records for the SESF and the submission of a final report. The school must complete the Steans Emergency Scholarship Fund Scholar Form for each student receiving a grant to be submitted with your final report. The Steans Emergency Scholarship Fund Scholar Form is attached. The final report will be due by March 21, 2014. If a report is not provided, your school may be considered ineligible for future grants with the Steans Family Foundation. Handwritten applications and/or reports will not be accepted. Thanks so much for your interest in the Steans Emergency Scholarship Fund. For additional questions regarding this program, please contact Anjali Alva at aalva@fic-sff.com.